Happy Monday everyone! Does anyone even say that? Is Monday ever happy? I don’t know, probably not, usually just Friday is happy I suppose. But I’m kind of excited about this week, because I have a whole week of awesome Asian recipes for you! Not that I’m any kind of an expert on Asian food, I’m certainly not, but I do enjoy it. And all three of the Asian recipes I have for you this week were amazing. I actually made all of them the same night and we had an Asian feast. I can’t say I’d recommend doing that! It kind of made for a lot of cooking for one weeknight meal, but if you feel like spending a lot of time, they did all go together really well. And it made for an awesome meal with a lot of leftovers. So there’s that. But I think I may go with one at a time next time, and this veggie fried rice could really be a meal all on it’s own! I haven’t always enjoyed Asian food actually. And it still kind of depends on the day. And the food. I used to love it, and would be willing to go out for Chinese food pretty much anytime. But after a bad experience with it while expecting my first child, I couldn’t really work up any kind of an appetite for it. Seriously kept me away from Chinese food for 9 years. My husband is pretty darn happy about this recent turn of events where I’ll eat it again, and even make it for him! He absolutely loves it, and for 9 years my answer has been no to eating any kind of Asian food! But I think I can finally eat it again! Yay! And I’m starting with making more veggie fried rice. I’d never actually made fried rice before this, but I will be making it again soon. It was so tasty and so easy to make! And the leftovers were just as good as the original meal, which was great because we had a lot of leftovers. If you’ve never made your own fried rice either, I would definitely recommend it. It really was amazing. 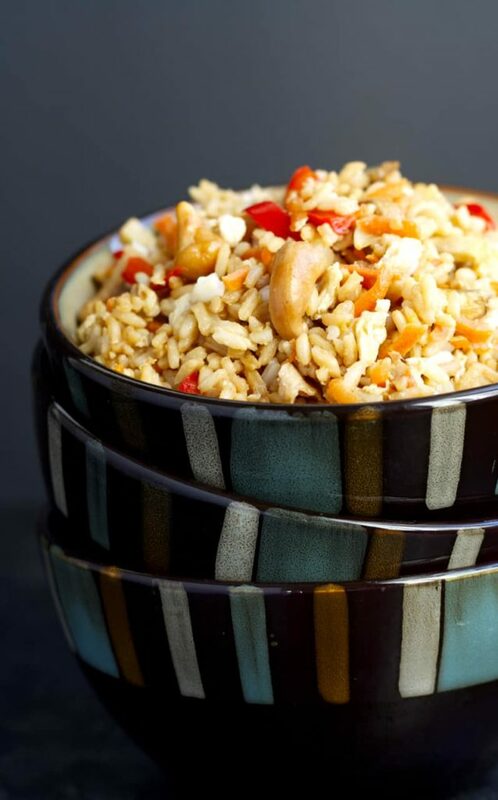 This veggie fried rice is easy to make, and is very customizable. You can really put in whatever veggies you like, or add in some shrimp or chicken to make it a full meal. The only thing to remember is that the cooked rice should be cold before using it in the recipe. If you use freshly cooked hot rice, it will end up rather mushy. And if spicy food is your thing, I had the leftovers for lunch with some sliced turkey pepperoni mixed in and drizzled it all with sriracha. To die for! Really. In a large nonstick skillet heat 1 tablespoon of the olive oil over medium heat. Add the onion and garlic and cook for 2-3 minutes until softened. Add the carrots, mushrooms and red pepper and continue to cook, stirring, until crisp tender, about 3 minutes. Move the veggies to a bowl. In the same skillet, add another tablespoon of olive oil and cook the eggs, stirring, until scrambled, then remove them to the same bowl as the veggies. If needed, add the last tablespoon of olive oil to the skillet and add the cold rice. Make sure the rice is cold, not just cooked or it will end up mushy. Cook for 3-4 minutes, breaking up the clumps and stirring until heated. Turn the heat down to low and add back the veggies/eggs, cashews and soy sauce. Stir everything together and cook until heated through. This fried rice looks perfect, Stacey! So glad you can enjoy Asian food again! I grew up eating it but I can remember a few times when I had takeout from a few places and it totally ruined the experience for me too. Thank goodness for homemade :) A theme night sounds like so much fun! Love all the veggies in yours and can't wait to see what other dishes you made! Yay for fried rice!!! I was looking at the rice going ha! She makes it similar to me! :) I'm a little tired at the moment! So glad you enjoyed it!! Isn't it amazing how one experience can almost ruin a food? I got sick once after having something with sesame oil (not the fault of the sesame oil) and I still can't use it! Makes me almost queasy! I love recipes (like this) that are customizable. This looks delicious! I can't wait to make it! I know, customizable recipes are the best! Thanks Annie! Can't wait to see the other 2 recipes! I'm sure they're as amazing as this! Oh my gosh - what's not to like...it looks delicious, love all the ingredients, great pictures...and I really like those bowls too! Ohhh I can't wait to see all of your yummy asian recipes. This looks delicious! Can I have a bowl for dinner please? Pinned!! Fried rice is one of my favorite Asian dishes. Glad that you are getting back into Asian food. It's awesome! Yeah I"m really glad I can eat it again! Thanks Kelley! looks awesome Stacey! 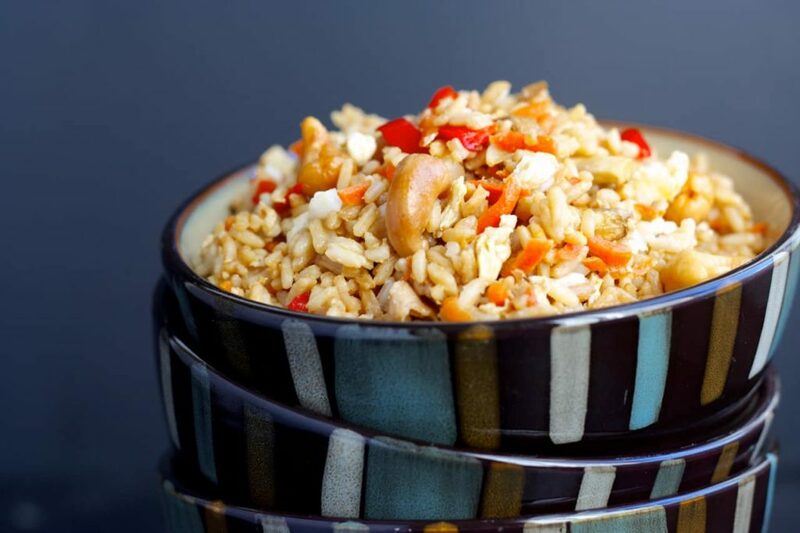 :) Veg fried rice is one of my favorites, it's so easy to throw together and tastes great! A whole week of Asian-inspired recipes!? I love themed weeks! (I need to do it more often). This sounds like a spectacular way to kick it off! Looks so perfect! 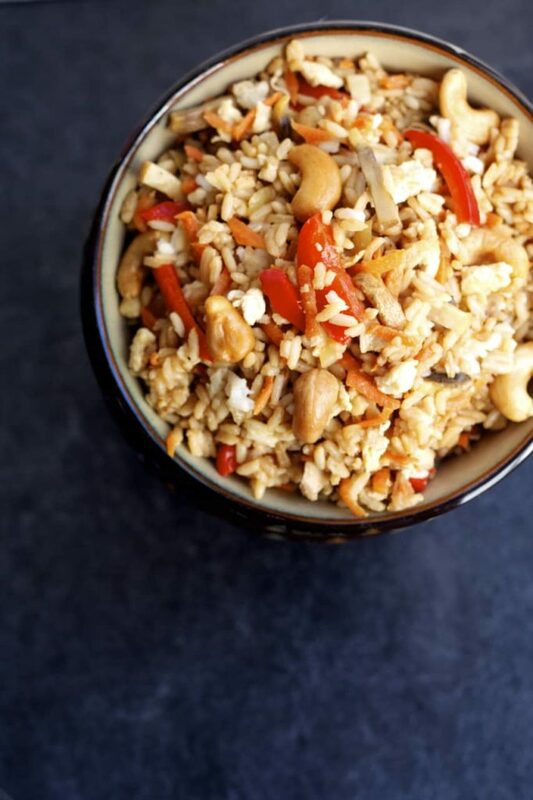 We loved the cashews in this, but then, we love cashews in pretty much anything! :) Thanks Oriana! This fried rice looks perfect, Stacey! I love all of the veggies in here. I love making a meal just out of fried rice so this sounds perfect! Love the mushrooms in here, too! 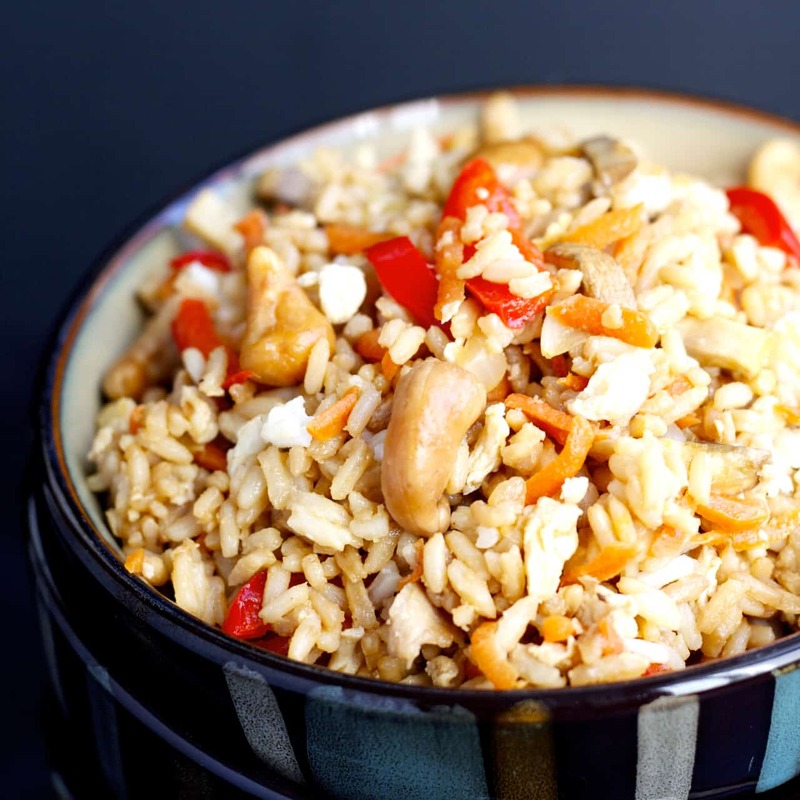 I love mushrooms in pretty much anything, but especially in fried rice! Thanks Gayle!